The complete marketing analysis of your Google Ads campaigns, centered on a report with other channels such as social networks and website. Choose the metrics that matter most to your project. Create templates that can be replicated to other reports or other projects. Reportei’s Google Ads reports can be compared to several times in the past. Even at the time of the free trial, you get data from previous years. 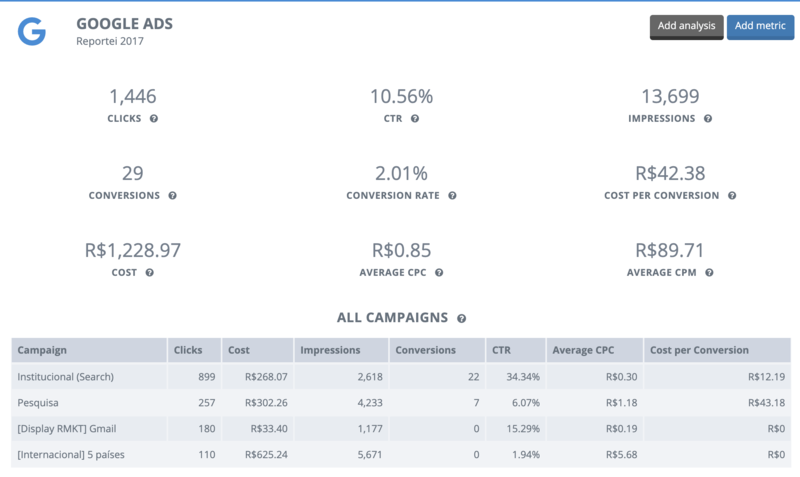 Each metric shows different aspects of a Google Ads campaign performance. To do this, you can customize the way the data is displayed, as well as the entire layout of the report.